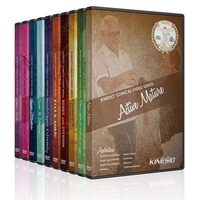 Ten exciting DVD's designed with your practice in mind. Kinesio® DVD's with titles, applications, and market focus. All DVD's will be high quality disks that include a digital download copy for mobile devices. Each DVD is about 45 minutes in duration featuring Kinesio® Taping experts that specialize in the field. Active Mature: Hand Pain (arthritis, Back Pain (arthritis), Knee Pain (arthritis), Bunions, Knee Valgus, Kyphosis, Balance and Overhead Reach. Acupuncture: Abdomen, Menstrual Cramps, Foot, Stress Relief, Upper Respiratory Infection, Neck and Shoulder, Lower Back Pain and Knee. Chiropractic & Osteopathic: Cervical Spine, Mid Back Pain, Shoulder Pain, Rib Subluxation, Low Back and /or SI Joint, Wrist Pain/Carpal Tunnel, Knee Swelling, Lateral Ankle Sprain/Swelling. Exercise & Fitness: Arch/Plantar Fasciitis, Shoulder Sprain, Low Back Strain, Lower Leg/Shin Splints, IT Band, Runners Knee Support, Ankle Sprain and Tennis/Golfers Elbow. Foot & Ankle: Bunion, Hammer Toe, Flat Feet, Plantar Fasciitis, Achilles Tendonitis, Edema/Inflammation, Ankle Sprain and Pin in the Top of Foot. Hand/Upper Extremity: Skiers/Gamekeepers Thumb, de Quervain's Tenosynovitis, Carpal Tunnel Syndrome, General Arthritis, Trigger Finger/Thumb, Golfers/Tennis Elbow, Mallet Finger and Edema. Scar & Edema: Thigh Swelling, Bruising, Pitted Scars, Vertical Adhered Scar, Multi-Directional Scars and After Open Wound Phase 1 and Phase 2. Throat & Mouth: TMJ, Jaw Stability, Bell's Palsy, Constipation, Opening of Diaphragm, Orbicularis Oris, Chin Tuck and Swallowing. Women's Health: Headaches, Upper Back & Neck, Menstrual Cramping, Mid Back, Low Back, Varicose Veins, Stretch Marks and Abdominal Fascia.